MATTHEW 5:6 KJV "Blessed [are] they which do hunger and thirst after righteousness: for they shall be filled." 3Blessed are the poor in spirit: for theirs is the kingdom of heaven. 4Blessed are they that mourn: for they shall be comforted. 5Blessed are the meek: for they shall inherit the earth. 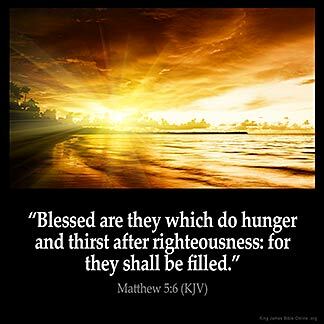 6Blessed are they which do hunger and thirst after righteousness: for they shall be filled. 7Blessed are the merciful: for they shall obtain mercy. 8Blessed are the pure in heart: for they shall see God. 9Blessed are the peacemakers: for they shall be called the children of God. Blessed are they which doe hunger and thirst after righteousnesse: for they shall be filled. Happy are those whose heart's desire is for righteousness: for they will have their desire. Blessed are those who hunger and thirst for righteousness, for they shall be completely satisfied. Blessid ben thei that hungren and thristen riytwisnesse, for thei schulen be fulfillid. 5:6 They that hunger and thirst after righteousness - After the holiness here described. They shall be satisfied with it. Mt 5:6 Blessed [are] they which do hunger, etc. This implies the same sense of spiritual needs as verses 3 and 4. Hunger is a felt want, in this case a want of righteousness before God, the righteousness that comes from the forgiveness of sins. See Lu 15:17 Mt 5:3,4. I believe what this means is to allow God's righteouness that is Christ Jesus to be the one to satisfy our every need.In every good thing we seek to do as we know grace abounds.Our God is gracious and abounding in love and He watches His word to perform it.Every desire in us God created so its a must to be fulfilled by God alone.The God in us the Holy Spirit. People of GOD let our goal everyday be working toward righteousness is the only to please GOD,so HIS GRACE will follow us. There was a time that I was hungry and thirsty to know the ways that the world did things and to become a part of them and do what they do. It led me to death and destruction YUK !!! God had mercy on me and brought me out of that miry pit !! Now I have a desire to be like Jesus and to do what He and my Heavenly Father does and to know Him better every day and to walk with Him Walk with Him Walk with Him !!!!! Righteousness come from God forgiving us of our sins!